The Gurmukhi script of Gurbani has 35 akhar, or consonants, identical to the Punjabi paintee alphabet including three vowel holders and 32 consonants. Each character represents a phonetic sound. Alphabetical order of the Gurmukhi script is entirely different than the English alphabet. Gurmukhi akhar is based on groupings having certain similarities and is arranged in a grid of five horizontal and seven vertical rows with specific pronounciation properties (that is not shown here). Each letter has a combination of characteristics depending on its horizontal and vertical position. Some letters are pronounced with the tongue touching the back of the upper teeth or curled back to touch just behind the ridge on the roof of the mouth. Letters may be pronounced with a puff of air or require holding air back. Some characters have a nasal sound. Verses of Gurbani have spiritual significance in Sikh scripture and contain metaphoric passages in which the various Gurmukhi letters figure. Phonetic spellings of letters in translations vary. Oorraa is the first of three vowel holders appearing in the Gurmukhi script of Gurbani and is identical to the vowel holders of the Punjabi alphabet (akhar). Oorraa is pronounced with equal emphasis on both syllables and sounds like ewe-raw. Oorraa is used at the beginning of a word where the first sound is that of a vowel or in any word where the vowel is not preceded by a consonant as in the case of a double vowel sound and has specific vowel sounds assigned to it The Romanized spelling of Oorraa is phonetic and may also appear spelled as Oorhaa. Spellings may differ slightly in original Gurmukhi as well as Romanized and English translations of Gurbani. Airraa is the second of three vowel holders appearing in the Gurmukhi script of Gurbani and is identical to the vowel holders of the Punjabi paintee alphabet. Airraa is pronounced with emphasis on the second syllables and sounds like era or err-raw. Airraa is used at the beginning of a word where the first sound is that of a vowel or in any word where the vowel is not preceded by a consonant as in the case of a double vowel sound and has specific vowel sounds assigned to it The Romanized spelling of Airraa is phonetic and may also appear spelled as Airhaa. Spellings may also differ slightly in original Gurmukhi as well as Romanized and English translations of Gurbani. Eerree is the third of three vowel holders appearing in the Gurmukhi script of Gurbani and is identical to the vowel holders of the Punjabi Paintee alphabet. Eerree is pronounced with emphasis on the second syllables and sounds like era or err-raw. Eerree is used at the beginning of a word where the first sound is that of a vowel or in any word where the vowel is not preceded by a consonant as in the case of a double vowel sound and has specific vowel sounds assigned to it The Romanized spelling of Eerree is phonetic and may also appear spelled as Eerhee, or Iri. Spellings may also differ slightly in original Gurmukhi as well as Romanized and English translations of Gurbani. Sassa is one of 35 consonants of the Gurmukhi script of Gurbani and identical to the Punjabi alphabet. The consonants of Gurmukhi are known as 35 Akhar. Sassa has the sound of S and is pronounced with the emphasis on the second syllable like sa-saw. The Romanized spelling of Sassa is phonetic and may also appear spelled as Sassaa. Spellings may differ slightly in original Gurmukhi as well as Romanized and English translations of Gurbani. Haahaa is a consonant of the Gurmukhi akhar script of Guru Granth Sahib and is nearly identical to the Punjabi paintee alphabet. Haahaa represents an H sound as in ha-ha with equal emphasis is given to both syllables and is pronounced so that when spoken there is a puff of air felt when the hand is held in front of the lips. The Romanized spelling of Haahaa is phonetic and may also appear spelled as Haha. Spellings may differ slightly in original Gurmukhi as well as Romanized and ​English translations of Gurbani. Kakaa is a consonant of the Gurmukhi alphabet. Kakaa is a consonant of the Gurmukhi script and is almost identical to the Punjabi paintee alphabet. Kakaa is pronounced as cka ckaaw (caw), with emphasis on the second syllable. There should be no puff of air when when the hand is held in front of the lips. The Romanized spelling of Kakaa is phonetic and may also appear spelled as Kakka. Spellings may differ slightly in original Gurmukhi as well as Romanized and English translations of Gurbani. Sikh scripture includes the acrostic form of poetic verse in selections throughout the Guru Granth Sahib. Khakhaa is a consonant of the Gurmukhi alphabet. Khakhaa is a consonant of the Gurmukhi script of Gurbani and identical to the Punjabi alphabet. Khakhaa has the sound of Kh and is pronounced as ka-kaaw (caw), with emphasis on the second syllable. There should be a puff of air when when the hand is held in front of the lips. The Romanized spelling of Khakhaa is phonetic and may also appear spelled as Khakha. Spellings may differ slightly in original Gurmukhi as well as Romanized and English translations of Gurbani. Sikh scripture includes the acrostic form of poetic verse featuring Khakhaa of the Gurmukhi alphabet and appears in various selections throughout the Guru Granth Sahib. Gagaa is a consonant of the Gurmukhi akhar alphabet. Gagaa is a consonant of the Gurmukhi akhar script of Gurbani and identical to the Punjabi paintee alphabet. Gagaa is pronounced as ga-gaw, with emphasis on the second syllable. There should be no puff of air when when the hand is held in front of the lips. The Romanized spelling of Gagaa is phonetic and may also appear spelled as Gagga. Spellings may differ slightly in original Gurmukhi as well as Romanized and English translations of Gurbani. Sikh scripture includes the acrostic form of poetic verse and appears throughout the Guru Granth Sahib with significance spiritual insights featuring the Gagaa of the Gurmukhi alphabet . Third Guru Amar Das ponders the immensity of the universal Lord. Ghaghaa is a consonant of the Gurmukhi alphabet. Ghaghaa is a consonant of the Gurmukhi akhar script which is very similar to the Punjabi paintee alphabet. Ghaghaa is pronounced as gha ghaaw, with emphasis on the second syllable. There should be a puff of air when when the hand is held in front of the lips. The Romanized spelling of Ghaghaa is phonetic and may also appear spelled as Ghagha. Spellings may differ slightly in original Gurmukhi as well as Romanized and English translations of Gurbani. Sikh scripture includes verses featuring Ghaghaa of Gurmukhi alphabet by various authors of Gurbani and appears throughout the Guru Granth Sahib. Fifth Guru Arjan Dev emphasizes that there is only God. Bhagat Kabir tells where the divine is found. Third Guru Amar Das gives the insight that however much the soul searches it recognizes not the true gifts and blessings. Ngangaa is a consonant of the Gurmukhi alphabet. Ngangaa is a consonant of the Gurmukhi akhar script of Gurbani and identical to the Punjabi paintee alphabet. Ngangaa has the sound of NG and is pronounced with the emphasis on the second syllable. The Romanized spelling of Ngangaa is phonetic and may also appear spelled as Nganga or Nganngaa. Spellings may differ slightly in original Gurmukhi as well as Romanized and English translations of Gurbani. Sikh scripture throughout the Guru Granth Sahib includes alphabetical acrostic compositions in the form of poetic verse featuring insights of spiritual significance. Fifth Guru Arjund Dev expounds on scholars of spiritual wisdom and the pitfall of the material world in these lines. 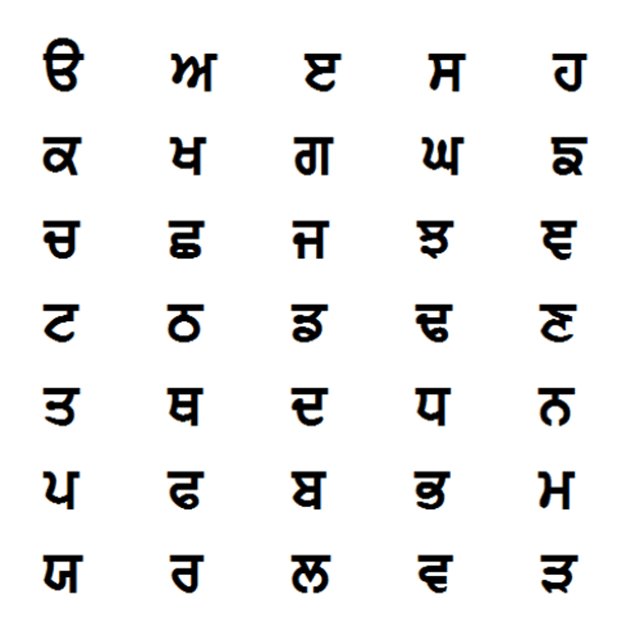 Chachaa is a consonant of the Gurmukhi alphabet. Chachaa is a consonant of the Gurmukhi akhar script of Gurbani that is identical to the Punjabi paintee alphabet. Chachaa is a symbol for CH and is pronounced with the tongue just behind the upper teeth like ch in itch with emphasis on the second syllable. Chachaa is phonetic and may also appear spelled as Chacha. Phonetci spellings may differ slightly in original Gurmukhi grammar as well as Romanized and English translations of Gurbani. Throughout the scripture of Guru Granth Sahib the acrostic form of poetic verse expounds upon the spirtual significance of the Gurmukhi alphabet. Fifth Guru Arjun Dev in his verse describing his relationship to the divine. Bhagat Kabir whose poetry is descriptive of divine artistry. Chhachhaa is a consonant of the Gurmukhi alphabet. Chhachhaa is a consonant of the Gurmukhi akhar alphabet of Gurbani and identical to the Punjabi paintee alphabet. Chhachhaa has the sound of C in ocean and is pronounced with the emphasis on the second syllable. The Romanized spelling of Chhachhaa is phonetic and may also appear spelled as Chhachha, or Shhassha and Shhasshaa. Spellings may differ slightly in original Gurmukhi as well as Romanized and English translations of Gurbani. Jajaa is a consonant of the Gurmukhi alphabet. Jajaa is a consonant of the 35 character Gurmukhi akhar script of Gurbani that is identical to the Punjabi paintee alphabet. Jajaa has the sound of J and is pronounced with the emphasis on the second syllable like ja-jaw. The Romanized spelling of Jajaa is phonetic and may also appear spelled as Jajja. Spellings may differ slightly in original Gurmukhi as well as phonetci Romanized and English translations of Gurbani. Jhajhaa is a consonant of the Gurmukhi alphabet. Jhajhaa is a consonant of the Gurmukhi script and identical to the Punjabi alphabet. Jhajhaa has the sound of Jh similar to J as in Jacques, Zs as in Zsa Zsa, or X as in Xenia and is pronounced as Jh-jhaaw or Zsa-Zsaa, with emphasis on the second syllable. There should be a puff of air when when the hand is held in front of the lips. The Romanized spelling of Jhajhaa is phonetic and may also appear spelled as Jhajha. Spellings may differ slightly in original Gurmukhi as well as Romanized and English translations of Gurbani. Sikh scripture includes the acrostic form of poetic verse featuring Jhajhaa of the Gurmukhi alphabet and appears throughout the Guru Granth Sahib. Njanjaa is a consonant of the Gurmukhi alphabet. Njanjaa is a consonant of the Gurmukhi script that is identical to the Punjabi alphabet. Njanjaa is said with the tongue pressed to the roof of the mouth behind the upper teeth with emphasis on the second syllable. Njanjaa is phonetic, Nj may also be written as Ny or even Ni and is pronounced like Enya, onion or California rather then enjoy or engine. Njanjaa may also appear spelled as Nyanya as spellings differ slightly throughout original Gurmukhi texts as well as Romanized and English translations of Gurbani. Sikh scripture includes acrostic forms of poetic verse featuring Njanjaa. Tainkaa is a consonant of the Gurmukhi alphabet. Tainkaa is a consonant of the Gurmukhi script which is identical to the Punjabi alphabet. Tainkaa sounds like tank-aw, represents a hard T as in tow, may be represented by a double TT and pronounced with the tongue curled back to touch the roof of the mouth. The Romanized spelling of Tainkaa is phonetic and may also appear spelled as Tanka, Tatta, or Ttatta as spellings may differ slightly in original Gurmukhi texts as well as Romanized and English translations of Gurbani. Tthatthhaa is a consonant of the Gurmukhi alphabet. Tthatthaa is a consonant of the Gurmukhi akhar which is identical to the Punjabi paintee alphabet. Tthatthaa has the sound of Th and is pronounced as tha-thaaw with emphasis on the second syllable. The tongue is curled back to touch the roof of the mouth and there should be a puff of air when when the hand is held in front of the lips. The Romanized spelling of Tthatthaa is phonetic and may also appear spelled as Tthattha, Thhathaa or other variations. Original phonetic Gurmukhi spellings may differ sightly as well as Romanized and English translations of Gurbani. Ddaddaa is a consonant of the Gurmukhi alphabet. Ddaddaa is a consonant of the Gurmukhi script feature in Gurbani and is identical to the Punjabi alphabet. Ddaddaa is represented by DD and is pronounced Da-daaw, with emphasis on the second syllable. The tongue is curled back to touch the roof of the mouth behind the gum ridge. The sound is similar to the double DD in Daddy or the D in toad or doctor. The Romanized spelling of Ddaddaa is phonetic and may also appear spelled simply as Dadda. Spellings also may differ slightly in original Gurmukhi as well as Romanized and English translations of Gurbani. Several shabads of Guru Granth Sahib feature Ddaddaa in an acrostic form of poetic verse having spiritual signifigance. Ddhaddhaa is a consonant of the Gurmukhi alphabet. Dhhadhhaa is a consonant of the Gurmukhi script featured in the hymns of Gurbani, and is identical to the Punjabi alphabet. Dhhadhhaa has the sound of Dh and is pronounced as dha-dhaaw, with emphasis on the second syllable. The tongue is curled back to touch the roof of the mouth behind the gum ridge. There should be a puff of air when when the hand is held in front of the lips. The Romanized spelling of Dhhadhhaa is phonetic and may also appear spelled as Ddhaddhaa or even variations of Dtadtaa. Spellings also may differ slightly in original Gurmukhi as well as Romanized and English translations of Gurbani. The acrostic form of poetry featuring Dhhadhhaa of the Gurmukhi alphabet appears in several of the Guru Granth Sahib hymns. Nhaanhaa of the Gurmukhi alphabet. Nhaanhaa is a consonant of the 35 Gurmukhi akhar of Gurbani and is identical to the Punjabi alphabet. Nhaanhaa is represented by Nh or a double NN has the sound of N as in burn. Nhaanhaa is said with emphasis equally on both syllables as in Na-na, and is pronounced with the tongue curled back to touch the roof of the mouth so that when spoken there is a slight puff of air when the hand is held in front of the lips. The Romanized spelling of Nhaanhaa is phonetic and may also appear spelled as Nanna. Spellings may also differ slightly in original Gurmukhi as well as Romanized and English translations of Gurbani. Tataa is a consonant of the Gurmukhi alphabet. Tataa is a consonant of the 35 Gurmukhi akhar of Gurbani and is identical to the Punjabi alphabet. Tataa represents the sound of T sounds and is said like ta-taw, with emphasis on the second syllable, and is pronounced with the tongue pressed against the back of the upper teeth. No air is felt when the hand is held in front of the lips. The Romanized spelling of Tataa is phonetic and may also appear spelled as Tatta. Spellings may differ slightly in original Gurmukhi as well as Romanized and English translations of Gurbani. Thathaa is a consonant of the Gurmukhi alphabet. Thathaa is a consonant of the 35 Gurmukhi akhar and is identical to the Punjabi paintee alphabet. Thathaa represents the sound of TH as in teeth, is said like Tha-thaw with emphasis on the second syllable, and is pronounced with the tongue pressed behind the upper teeth so that a puff of air is felt when the hand is held in front of the lips. The Romanized spelling of Thathaa is phonetic and may also appear spelled as Thattha. Spellings also may differ slightly in original Gurmukhi as well as Romanized and English translations of Gurbani. Dadaa is a consonant of the Gurmukhi alphabet. Dadaa is a consonant of the 35 Gurmukhi akhar of Gurbani and is identical to the Punjabi paintee alphabet. Dadaa is pronounced as da-daw, with emphasis on the second syllable. The D sound is made with the tongue pressed against the back of the upper teeth. There should be no puff of air when when the hand is held in front of the lips. The Romanized spelling of Dadaa is phonetic and may also appear spelled as Dadda. Spellings may differ slightly in original Gurmukhi as well as Romanized and English translations of Gurbani. Sikh scripture includes poetic verse featuring akhar consonant Dadaa of Gurmukhi alphabet and appears throughout the Guru Granth Sahib. Dhadhaa is a consonant of the Gurmukhi alphabet. Dhadhaa is a consonant of the 35 Gurmukhi akhar of Gurbani and identical to the Punjabi alphabet. Dhadhaa represents an DH sound as in Dha-dhaw with emphasis on the second syllable and is pronounced with the tongue pressed against the back of the upper teeth so that when spoken there is a puff of air felt when the hand is held in front of the lips. The Romanized spelling of Dhadhaa is phonetic and may also appear spelled as Dhadha. Spellings may differ slightly in original Gurmukhi as well as Romanized and English translations of Gurbani. DHADHA: Those who enshrine devotion dwell in the city of faith are the worthy ones whose minds are steadfast and stable. Nanaa is a consonant of the Gurmukhi alphabet. Nanaa is a consonant of the 35 Gurmukhi akhar of Gurbani and is identical to the Punjabi alphabet. Nanaa represents an N sound as in na-naw with emphasis on the second syllable and is pronounced so that the tongue touches the back of the upper teeth. There should be no puff of air when the hand is held in front of the lips. The Romanized spelling of Nanaa is phonetic and may also appear spelled as Nannaa. Spellings may differ slightly in original Gurmukhi as well as Romanized and English translations. Papaa is a consonant of the Gurmukhi alphabet. Papaa is a consonant of the 3k akhar of Gurmukhi script and is identical to the Punjabi alphabet. Papaa is represented by P and pronounced as pa-paw, with emphasis on the second syllable. The lips must first be pressed together then open to form the sound of Pa. There should be no puff of air when when the hand is held in front of the lips as Papaa is spoken. The Romanized spelling of Papaa is phonetic and may also appear spelled as Pappa. Spellings may differ slightly in original Gurmukhi as well as Romanized and English translations of Gurbani. Sikh scripture includes acrostic poetic verses featuring Gurmukhi consonant Papaa in the shabads of Gurbani. Phaphaa is a consonant of the Gurmukhi alphabet. Phaphaa is a consonant of the 35 akhar of Gurmukhi script and is identical to the Punjabi alphabet. Phaphaa is represented by PH as in elephant and is pronounced as pha-phaw, with emphasis on the second syllable. The Romanized spelling of Phaphaa is phonetic and may also appear spelled as Phapha and occasionally F is or Faffa is used, however PH is more correct as the sound is fully aspirated. Note the difference between saying fork and elephant or phosphorous while holding the hands to the lips. The lips must first be pressed together and then open to make the sound. A distinct puff of air should be felt when said while holding the hand in front of the lips. Spellings may also differ slightly in original Gurmukhi as well as Romanized and English translations of Gurbani. Sikh scripture includes the acrostic form of poetic verse featuring Phaphaa of the Gurmukhi alphabet and appears throughout the Guru Granth Sahib. Babaa is a consonant of the Gurmukhi alphabet. Babaa is a consonant of the Gurmukhi 35 akhar and is the same as the Punjabi alphabet. Babaa is represented by B and pronounced as ba-baw, with emphasis on the second syllable. The lips must first be pressed together then open to form the sound of Ba. There should be no puff of air when when the hand is held in front of the lips. The Romanized spelling of is phonetic and may also appear spelled as Babba. Spellings may differ slightly in original Gurmukhi as well as Romanized and English translations of Gurbani. Sikh scripture includes a form of poetic verse appearing the Guru Granth Sahib that features the Babaa character of the Gurmukhi alphabet. Bhabhaa is a consonant of the Gurmukhi alphabet. Bhabhaa is a consonant of the Gurmukhi script 35 Akhar and is the same as that of the Punjabi alphabet. Bhabhaa is pronounced as bha-bhaw, with emphasis on the second syllable. The lips must first be pressed together and then open to make the sound. The Romanized spelling of Bhabhaa is phonetic and may also appear spelled as Bhabha. Spellings may also differ slightly in original Gurmukhi as well as Romanized and English translations of Gurbani. For Romanized transliteration purposes in Gurbani scripture, Bhabhaa is most often represented by BH but sometimes is written as P for non scriptural purposes when writing Romanized Punjabi, because as in the English way of saying P, a distinct puff of air should be felt when the hand is held in front of the lips. For example the Punjabi word word for sister might be spelled Bhainji or Penji in Roman letters. Sikh scripture includes the acrostic form of poetic verse featuring Bhabhaa of the Gurmukhi alphabet and appears throughout the Guru Granth Sahib. Mamaa is a consonant of the Gurmukhi alphabet. Mamaa is a consonant of the Gurmukhi script 35 akhar of Gurbani and is the same as its Punjabi alphabet counterpart. Mamaa is represented by M and is pronounced as Ma-maw, with emphasis on the second syllable. The Romanized spelling of Mamaa is phonetic and may also appear spelled as Mamma. The lips must first be pressed together and then open to make the sound. No puff of air should be felt when said while holding the hand in front of the lips. Spellings may also differ slightly in original Gurmukhi as well as Romanized and English translations of Gurbani. Yayaa is a consonant of the Gurmukhi alphabet. Yayaa is a consonant of the 35 akhar Gurmukhi script of Gurbani and identical to its Punjabi alphabet counter part. Yayaa is represented by Y and is pronounced as ya-yaw with the emphasis on the second syllable. The Romanized spelling of Yayaa is phonetic and may also appear spelled as Yayya. Spellings may differ slightly in original Gurmukhi as well as Romanized and English translations of Gurbani. YAYYA: Burn away the egoistic toughts of double-mindedness. Relinquish them and sleep peacefully in equipoise. YAYYA: Go seek refuge of the Saints. With their help, the terrible world-ocean is crossed over. YAYYA: Birth is not taken again. When the One name is taken with in the heart. YAYYA: This lifetime shall not be wasted, if one has support of the Pure Enlightener. YAYYA: People make efforts of may kinds. Raaraa is a consonant of the Gurmukhi alphabet. Raaraa is a consonant of the Gurmukhi script 35 akhar and identical to its Punjabi alphabet counterpart. Raaraa is a symbol for R and is pronounced with the tongue forward, is rolled and sounds like are-rrr. Raaraa is phonetic and may also appear spelled as Rarra. Spellings may differ slightly in original Gurmukhi as well as Romanized and English translations of Gurbani. Sikh scripture of the Guru Granth Sahib includes the acrostic form of poetic verse featuring Raaraa of the Gurmukhi alphabet. Lalaa is a consonant of the Gurmukhi alphabet. Lalaa is a consonant of the 35 akhar Gurmukhi script of and is identical to its Punjabi alphabet counterpart. Lalaa has the sound of L and is pronounced with the emphasis on the second syllable like sa-saw. The Romanized spelling of Lalaa is phonetic and may also appear spelled as Lalla, or Lallaa. Spellings may differ slightly in original Gurmukhi as well as Romanized and English translations of Gurbani. Guru Granth Sahib scripture includes an acrostic form of alphabetical poetic hymns featuring the Gurmukhi consonant Lalaa. Vaavaa is a consonant of the Gurmukhi alphabet. Vaavaa is a consonant of the 35 akhar Gurmukhi script of Gurbani and identical to its Punjabi alphabet counter part. Bikram and Vikram are both common, though probably not Wikram. Gobind is most common, but may also be spelled as Govind and even Gowind. Rrarraa is a consonant of the 35 akhar Gurmukhi script featured in Gurbani and is identical to its Punjabi alphabet counterpart. Rraarraa is pronounced with the tongue curled back to touch just behind the ridge at the roof of the mouth and sounds like ra. The Romanized spelling of Rraarraa is phonetic and may also appear spelled as Rhaarhaa. Other phonetic spellings may differ slightly in original Gurmukhi as well as Romanized and English translations of Gurbani depending on gramatical usage. RRARRA: Conflict is eliminated when associating with true the pious. The essence of religious rites and creeds is meditation done in adoration of the Lord's Name. The opinionated argue foolishly in faithless disputes. Whose heart is filled with prideful intellect in ignorance bickers. RRARRA: Dispute is settled by the enlightened mouth which ceases to quarrel. Ik Onkar is a combination character of the Gurmukhi Script. Ik Onkar is a combination character featuring the Gurmukhi numeral 1 and is symbolic of One Creator and Creation, in the verse Mool Mantar which appears at the very beginning of Gurbani, and throughout Sikh Scripture. Ik has a short i sound as in lick. O has a long o sound as in oat. An has short a sound like the u in un. Kaar has a long aa sound as in car. I know only the One Creative Original Being. What is written is also erased, I believe not in the perishable. Creator and creation, behold them (as One).